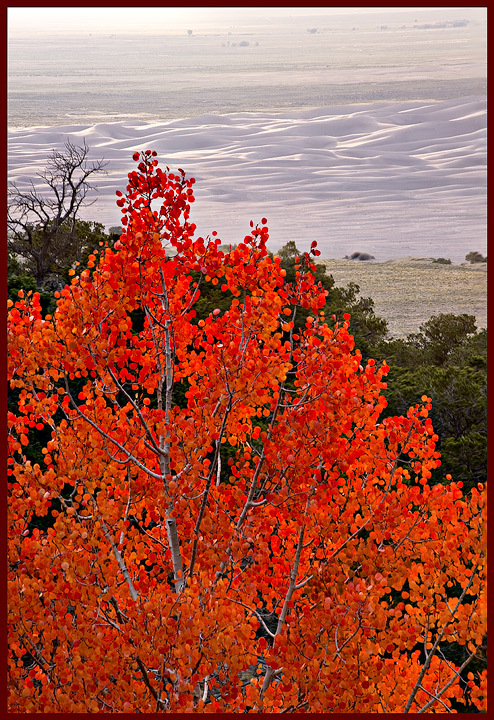 I've been fascinated by red aspen for a few years now--ever since i saw my first red clone out at Kebler Pass during my first fall photo trek in Colorado. They are like pink diamonds to me (or pearls ); rare and precious. 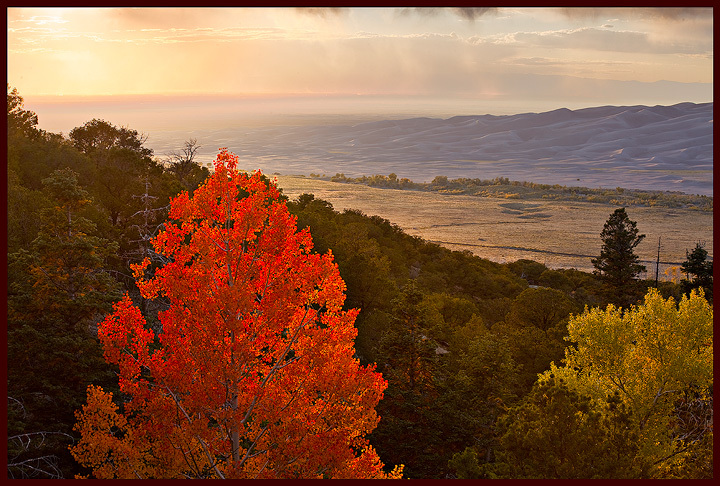 A couple years ago I found a big grove of beet-red aspen a few miles off trail in the Sangre de Cristo range. I tried to photograph them last week, but after two hours of crawling over downed trees and up steep rugged terrain, I ran out of water and threw in the towel--I probably was within a couple hundred yards of my goal, but who knows. 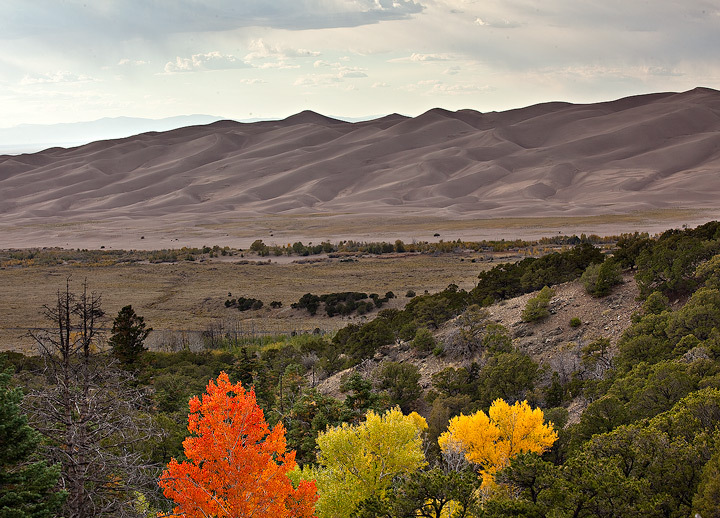 So, I was a bit disappointed, and to console myself I took a trip to the Great Sand Dunes the other day. 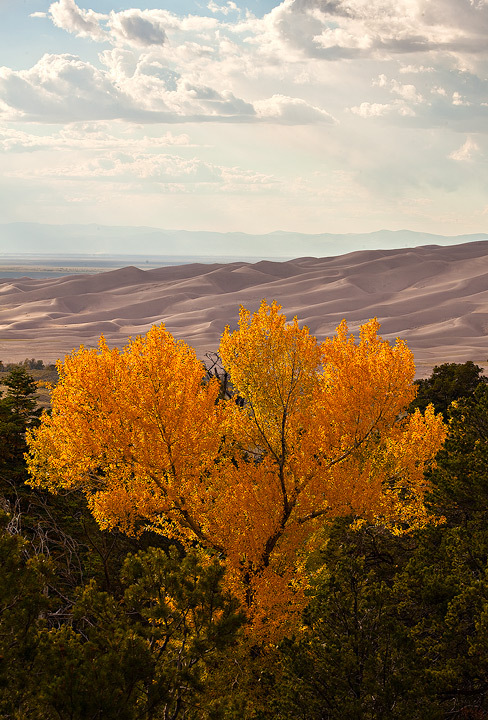 I wanted to get an angle on the dunes that had never been captured before, so I visualized looking down on the dunes at sunset, from one of the aspen groves high up on the slopes of the Sangres. That was my idea anyways, until I arrived at the park, and while I was scanning for a nice patch of (yellow) aspen to shoot from, something caught my eye. 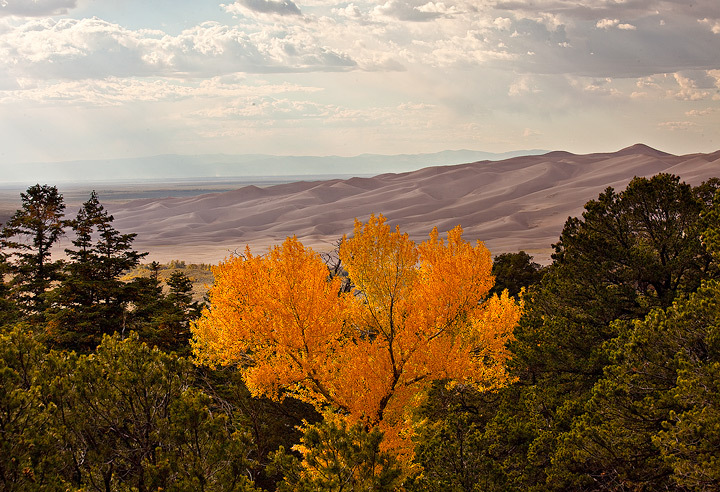 A solitary red aspen tree glowing in the early afternoon sun. I knew right away that was my subject. It looked like an easy bushwack from the road--but these things always look easy from below! I actually had to crawl through some dense brush and thorn bushes, then scramble down a deep ravine over rocks and sharp trees--one of which carved a nice gash in my leg. But blood wasn't squirting out, just dripping, so I persevered and made it to my prize. Steep ravine gives an idea of the terrain the aspen were living in! 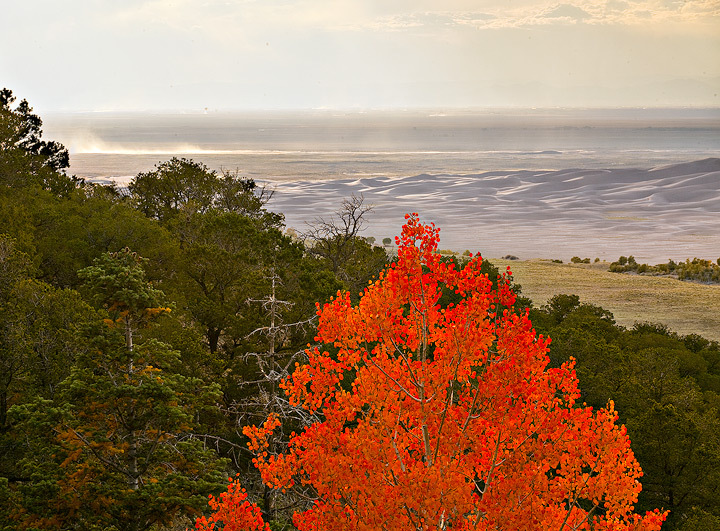 A distant shower kicks up dust overt the San Luis Valley. 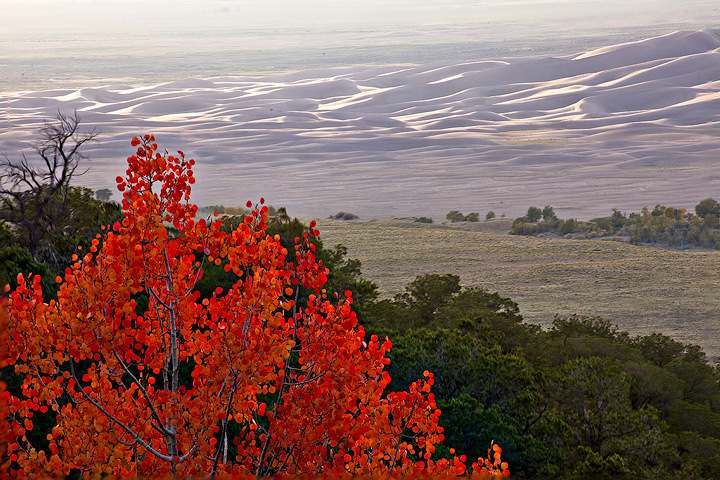 Interesting trio of trees overlook the dunes. 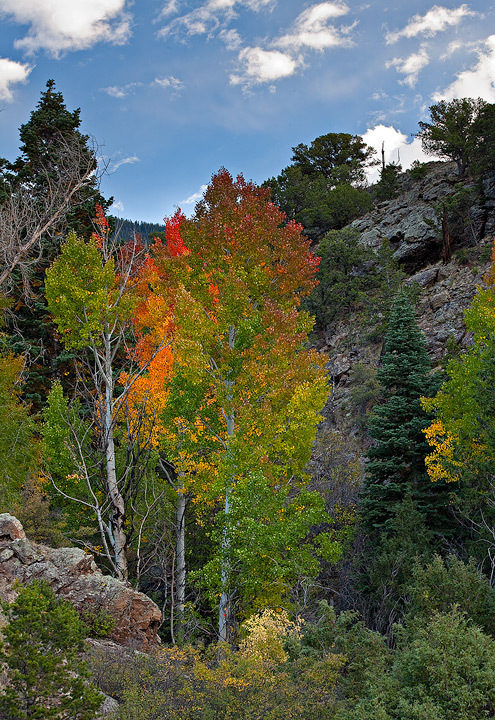 Horizontal view of the fall colors, September 27, 2011. 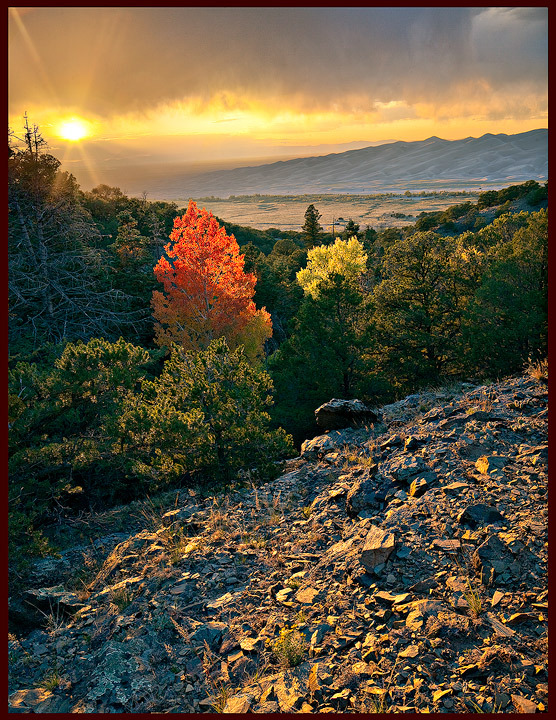 Lone red aspen at sunset. A single yellow flower looks on from the front row.